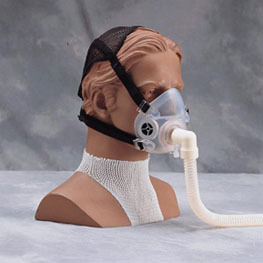 Reusable Adult & Pediatric Sizes All Adult masks now have safety inhalation ports, which may make them acceptable for home use, however, apnea alarm is still recommended. (See photo) Pediatric masks do not have these ports and must be used with a pressure or apnea alarm. Warning: Pressure or Apnea Monitoring required with pediatric masks! BiPAP tm is a registered trademark of Respironics Inc.